Copyright �2013 PopEntertainment.com. All rights reserved. Posted: March 27, 2013. Even though Ryan Gosling is now one of the faces of young Hollywood, don't tell him that. The guy doesn't take stardom or gossip columns or "sexiest guy alive" stories seriously, he's just an artist practicing his craft. 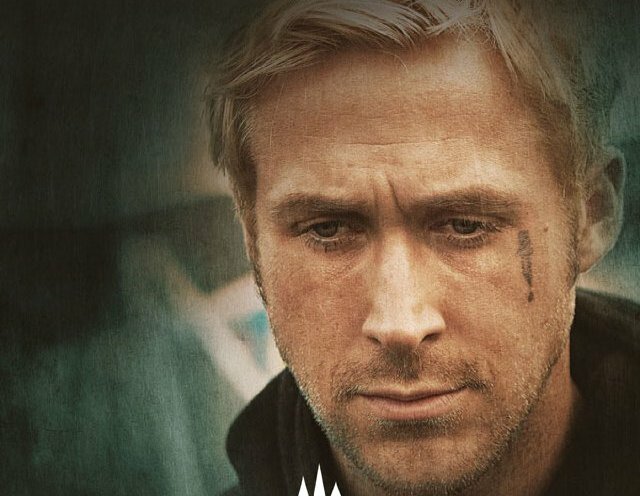 Instead, Gosling has shown uncanny taste in choosing films and a wonderful opportunity to balance quirky independent films like Half Nelson, Blue Valentine, Drive and Lars & the Real Girl with Hollywood studio fare like Crazy Stupid Love, The Ides of March and The Notebook. Gosling's latest reunites him with Blue Valentine director Derek Cianfrance. 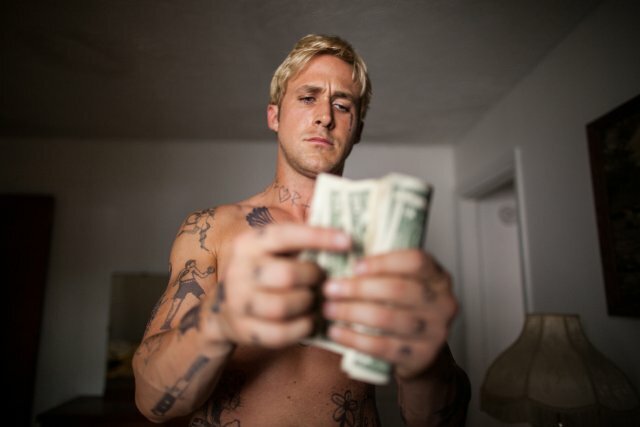 In The Place Beyond the Pines, Gosling plays Luke, a carny stunt motorcyclist. When passing through Schenectady, NY with his carnival, Luke runs into Romina (Eva Mendes), a gorgeous young waitress with whom he'd had a fling the year before. When Luke finds out that their one-nighter has produced a baby named Jason, he decides to settle down and try to become a good father and boyfriend. However, stunt riding is not a very in-demand skill and in a desperate attempt to earn money to care for his new family, Luke makes an ill-conceived decision to try robbing banks. A couple of weeks before The Place Beyond the Pines was released, Gosling met with PopEntertainment.com and a few other media outlets at the famous Waldorf-Astoria in New York to tell us about his experience on the film and fill us in a little on his career. Had you ridden motorcycles before like you did in the movie? Are you used to it? Did they have to train you for stunt work? Yeah. I did get a lot of training, because it was in the nature of the way Derek wanted to shoot the film. A lot of things were in one take. Especially, the bank robberies � he wanted them all to be shot all in one take. That meant riding from down the street in front of the bank, running in, robbing it and then the getaway. So I had to do more than I probably would have to do on a regular film. But the really cool stuff was done by Rick Miller. When Batman gets on a motorcycle, it is Rick in the bat-suit. Were there any stunts that worried you while you were doing them? Yeah. There were a couple. I wasn�t worried because I was working with a great stunt team and they had planned and choreographed everything very carefully. [But] there was one where I had to ride from like four blocks away, park in front of the bank, run in, rob it, get out, get on my bike and then drive into oncoming traffic and dodge a bunch of oncoming cars. That was quite something. Why do you keep working with Derek? What is it about him that is different from other directors? He�s really unlike any other director I have worked with. It�s hard to explain the amount of effort it takes for him to make a film that feels so effortless. Although his filmmaking is cinematic and beautiful it�s also kind of invisible. He really makes the performances the focus and tries to make the camera invisible � to us and also to the audience. At the same time he makes these wildly cinematic movies, but they are not self conscious. He tees it up for the actors to be natural because he puts so much work into the environment. For instance at the bank. All the people who worked at that bank actually go that bank and he surrounds you with that environment and sets the bar and we have to try to meet that level of authenticity. This was an intense movie. How did you shake it off emotionally and physically? How did I shake it off? I don�t know. I think it�s still with me to a certain degree. I learned a lot from making this film. We were making Blue Valentine and I shared with him that I had this cockamamie theory that I could rob a bank and get away with it, if I wasn�t so afraid of jail. This was my plan � that I would do it this way. 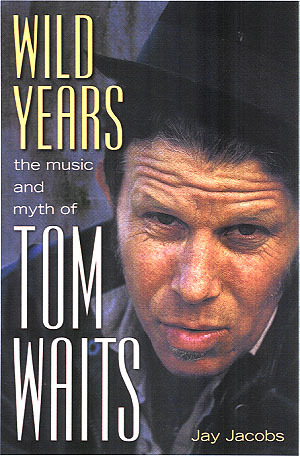 He said, "That�s crazy, I just wrote a movie about that." So it felt like we should make that movie. Do you find it hard to play a character who tries to get redemption but doesn�t accomplish it? It always leaves you with a melancholy taste in your mouth. Was it difficult for you? No, I really thought that it was interesting. Coming from a film [Gangster Squad] where millions of bullets fly and no one gets hurt and there are no consequences for your actions and everything is fine at the end of the day, I was impressed that Derek was trying to make a film that was just the opposite of what�s so popular right now. Only two shots are fired in this movie and those shots resonate throughout the entire film. It�s all about consequences. In the case of my character it�s this guy who is sort of a melting pot of masculine clich�s: muscles, tattoos, motorcycles, guns, knives. Then he sees he has this child that he didn�t know he had and a mirror is held up to him. He realizes that those things don�t make you a man at all. That he is not a man at all, that he�s just a surface and superficial person without depth. So in keeping with his character [he] does this melodramatic over-romanticized idea of how to turn a sinking ship around. What were ways you prepared for some of the emotional scenes with Eva and the baby who played your son? How did you get into the mindset? Another great thing about Derek is that he never writes those emotional marks in the script. You never fee like you are coming to the set and you have to hit some emotional marks. They happen naturally. One of the things was very helpful for me, although embarrassing to me at the time and a little today. We wanted to make the tattoos a mess and look like someone who had lived a life of not thinking things through and making bad decisions. I went for the face tattoo and I showed up on the set and I said, "I can�t do this. It looks dumb. I can�t do this." And Derek said, "I�m sure that�s how most people feel about their face tattoo. Most people probably regret them. So you are stuck with it." This movie is about consequences. I was so ashamed that I had done that � that I had pushed it so far. That I thought this is going to be distracting in the movie. I�m ruining the movie. I just felt this overwhelming sense of shame that I don�t think I could have acted. When I was holding the baby � Tony Pizza, the kid who plays our child � I kind of felt ashamed that this person I created was his father. I was glad that Derek held my feet to the fire in that because it really made me walk around with this. I didn�t even want to look at myself in the mirror. I felt like I understood what it was like. The city of Schenectady played such a major role in the movie. What was it like really being in the bank and the other locations? I loved Schenectady. It reminded me a lot of where I grew up: Cornwall, Ontario. There are a lot of similarities. Talk about how realistic everything was. Sometimes it backfired, like in the bank robberies. I got to the place and I am there and looked down and everyone is smiling and had their cell phones out. (laughs) Just having a good time. That was rough. Because I thought "Oh no, what are we going to do?" and Derek was blaming me, saying "you are not being scary enough." If this movie were cast with old-time actors who do you imagine in your role � James Dean? A young Marlon Brando? What do you think is so appealing about dark themes � to you and to audiences? Derek has this theory. He believes that cinema is a place where you can visit those private moments where the curtain is lifted and you see people for who they are. I think a lot of times mainstream movies are more about people who are confident. And independent films tend to be more about people who are not so confident about themselves, their lives, where they are headed or what they have done. Is it funny to play a character like in Drive where everyone wanted to be him and wear the jacket? Take on that persona and have people create a cultural icon over it? It was my dream to make a character that people went out for on Halloween. As a kid I would see on Halloween every Johnny Depp character out there and think how was he doing it? So when we did Drive, I was really hoping for the Halloween costume. People started sending me pictures on Halloween. It was working. There were Drive characters everywhere. How do you feel about the fan clubs on the internet, the scores of young girls and women who will follow you anywhere and everywhere? Is it weird, flattering? Do you like it? Remember when Fabio was on that roller coaster and he got hit in the face with a pigeon? (laughs) It was like, wrong place, wrong time. I have been kind of feeling like that pigeon lately. Did you start your next movie that you are directing? We start in a couple of months. I was nervous until I had my cast, but now that I have this cast I am excited. You can�t really go wrong. They are one of the best. I�ve been on the other side of a scene with most of them so I know how great they are. I like them all so much and I just can�t wait to see them in a movie together. Was this the most vulnerable you ever felt � directing this for the first time? There was no where to hide. What is your next movie about? You never stop making the movie until it�s finished. So I feel like it will be different when it�s over than what I say now. So I will wait until it�s done. Do you think producing and directing makes you a better actor? I�ll tell you after it�s done, I haven�t really done it. I heard that some fathers are calling their sons to spend some quality time together after seeing The Place Beyond The Pines since it is so much about the dynamic of fathers and sons. Is that something that was in your mind when you were creating the character of Luke, your own personal relationship with your father? It wasn�t because it is so different. Derek tries to keep it chronological so at the end of the day when I am presented with Tony Pizza [the baby] I tried not to have a preconceived idea or think too much about the themes in Derek�s films. He wants a certain level of naturalism and not pre-planned feelings or responses. I try not to think too much about it. Did you have much rehearsal with Eva or any of the cast members? I don�t think there was any rehearsal. For the most part he has you kind of live the lives as much as you can of those characters � not by working on the scenes but you coming to know the character by living their life. Did you live in that trailer during the shooting? What did you do to prepare for the role � rob banks? (Laughs) It was mostly we just spent a lot of time on the bike. Rick Miller and I riding around Schenectady for about a month. That was about it. There�s not much going on inside of Luke. He�s a pretty surface person, who is faced with his own lack of depth. I tried not to think too much. Do you try to balance out some of your darker roles with lighter ones so you don�t destroy yourself emotionally over and over again? Anything coming up that is more popcorn fare? I hope that all of them are popcorn fare. I�d like to say I had a good time making a comedy. I just loved working with Steve Carell [in Crazy Stupid Love]. I�d like to do that again. That was great. Any genre you want to do that you haven�t done before? No. I feel like I�d like to do more comedies. Drama is so subjective. It works or it doesn�t for someone. Comedy is either funny or it�s not. They laugh or they don�t. You can tell if it�s working or not. When you do drama it dissipates out into the ether, you never quite know if it�s is resonating. How difficult is it to find complex roles? Do you think there is a shortage of roles for adults? No, I think it�s a great time because anyone can make a movie. You are going to start to see very personal films. They might not necessarily need me anymore, but that�s okay. I guess that means I can do the same thing. CLICK HERE TO SEE WHAT RYAN GOSLING HAD TO SAY TO US IN 2008! CLICK HERE TO SEE WHAT EVA MENDES HAD TO SAY TO US ABOUT THE PLACE BEYOND THE PINES! #1 � 2013. Courtesy of Focus Features. All rights reserved. #2 � 2013. Courtesy of Focus Features. All rights reserved. #3 � 2013. Courtesy of Focus Features. All rights reserved. #4 � 2013. Courtesy of Focus Features. All rights reserved. #5 � 2013. Courtesy of Focus Features. All rights reserved. #6 � 2013. Courtesy of Focus Features. All rights reserved. #7 � 2013. Courtesy of Focus Features. All rights reserved. #8 � 2013. Courtesy of Focus Features. All rights reserved.